Tornado Twister II is a top caliber, durable, player friendly table that is made for both professional and hobbyist players but yet affordable to the general public and perfect for youth programs. The versatility of this table is perfectly fit any game room. It can be placed both at home and offices. 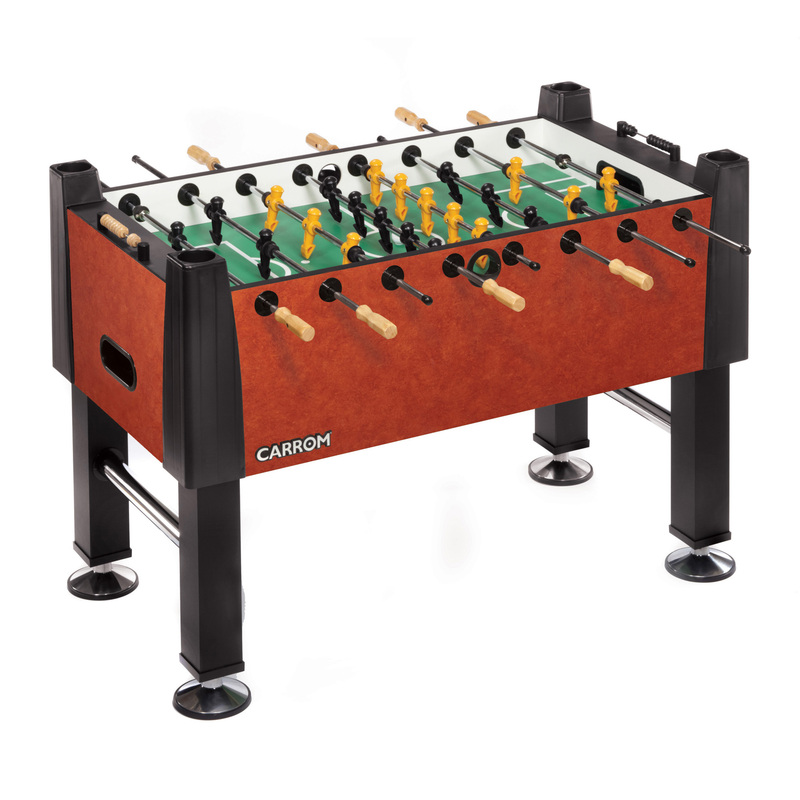 One of the main features of this table are the counterbalanced foosball men and the wooden handles. The counterbalanced men allow you to easily play one on one (1 vs 1) games because you can set the men horizontally without the fear of them falling down and getting in your way during game play. Like all Tornado Foosball tables, the Twister II foosball table surface is also solid, level and allows for fast foosball goaling shots. 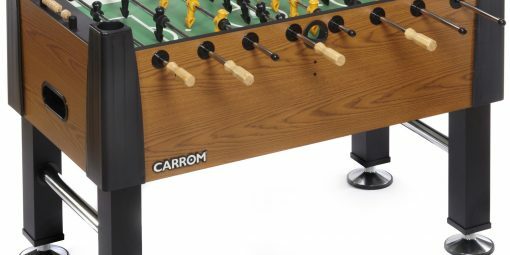 With the solid maple wooden foosball handles this table provides excellent grip. The solid commercial-grade legs design will not warp or split during heavy play. Comes with lightweight chrome plated hollow steel rods that are durable to resist bending. Adjustable leg levelers make installation and leveling easy on uneven floors centerless ground. A Three-man style goalie with counterbalanced foosball men allow easier cross-court shots. 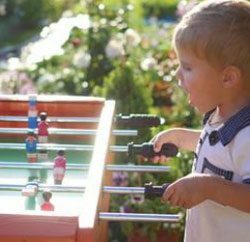 As for the men, Tornado Twister II Foosball table have figures that have a pointed toe that allows for better ball control. Men figures are a critical part of the table that can make or break your expertise to perform exceptional shots. 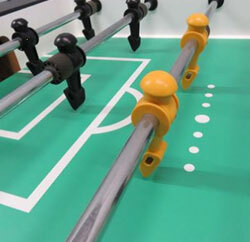 This will enable you to reach the foosball and pin the ball down for excellent shots like the snake shot. The common man that has a round, slick toe form will not provide you to pass the ball to players back and forth on the same rod and is not favorable to shooting bank shots. Bank shots need the sharp edge on the foosball man’s toe because you need to hit the ball off the side at a fine angle in order to hit a crisp bank shot. The following significant gameplay factor, the playing field, is crafted with exquisite detail and attention. It is leveled and smooth. You can expect minimum jostling even when the game gets rough. The remarkably exciting game is fun and competitive. With Twister II you will be a pro in no time because the table allows you the same feel as the real tournament tables made by Tornado. You can discover many trick shots with the special designed counterbalanced men on any Tornado table, including in this one. Expert Craftsmanship, every detail is designed to perfection. From classic solid maplewood handles to chrome-plated ball returns, you’ll love every inch of this beautiful Oak laminated table cabinet which compliments a variety of decors. The smooth laminate playfield helps resist nicks and spills. It has a green and white playing field with black versus yellow counterbalanced players. The wooden handle in maple wood on all rods is a great addition. It promotes a firm grip which transposes to a much better handle of the players. The material of the ball changes the gameplay in mysterious ways which means you can adjust the ball to the game you are playing. Twister II comes with patented centerless ground urethane textured foosball balls roll true and are easy to grip and shoot with single side ball return. Tornado Twister II comes with the most popular designs of the foosball players and it is also recognized as the robotic design. As you can see, the players are ordered and designed so they can control the ball in various ways. The shape of the feet could kick the ball in the different direction and that made the ball control easily. Tornado players have uniquely created foot which enables you to make complex tricks and even pick up the ball with your player. That is the reason why those are the most popular Tornado foosball table parts and the most popular players overall. This table was made to be a home and office model without all of the commercial class parts as the tournament variants or more costly home models. With Thirty-Four (34) inch height or raised to Thirty-Six (36) inches it is suitable for children of all ages and adults. Tornado tables are the best tables on the market hands down. Some other table brands may limit what shots you can perform, so Tornado tables, such as the Twister II, are the most recommended if you want to truly master the game. Players that have tried the table are amazed on what they can do and the ball control they obtain. Tornado was the only foosball table from 1983 straight through to 2003 in the World Foosball Tournaments. Tornado has the largest quantity of tournament tables all over the world than any other brand. You will observe this largely in Canada, England, Germany, Japan Malaysia, and the USA. Occasionally in Belgium and Holland and high accuracy and balance characterize this Tornado Twister II table. We recommend taking a look at the Tornado Storm II table before you purchase a Twister II because it offers one and a half inch side cabinet walls for greater stability and durability as well as adjustable legs. The Twister II comes in toward the lower-end of the Tornado tables with one side ball return, but still offers some nice features if you are looking for a good table and still on the top of the Tornado foosball table craigslist. 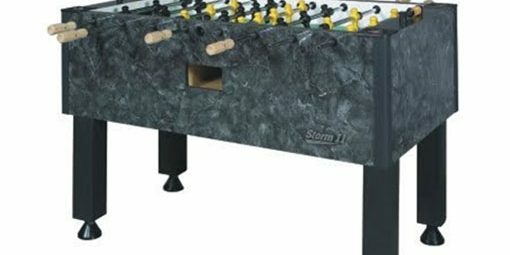 This is a professional table made for professional use and gives the performance and convenience parts that we look for when making a Tornado foosball table reviews. Solid maple wooden foosball handles provide excellent grip. Solid commercial-grade legs will not warp or split during heavy play.